Election season is here and with it comes an abundance of political signage. These signs can quickly multiply and get out of control if the City's rules and regulations are not strictly enforced. The photo above shows a landscape which we hope to avoid. While political signs do not require a permit, their placement must adhere to specific guidelines. 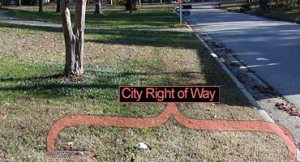 All political signs must observe the setback standards of the City's Zoning Ordinance and may not encroach in the right-of-way, typically the area between the sidewalk and the street or between a utility pole and the street or road. Please take a few moments to review the City's Sign Ordinance as it pertains to Political Signs, as outlined in Ordinance No. 1994-20, as amended, and Ordinance 411-2012. It is a homeowner's responsibility to find out if political signs are prohibited by subdivision regulations prior to placing a lawn sign at a residence. Political signs shall not exceed 6 square feet in a residential zoning district or 32 square feet in a non-residential zoning district. All political signs must be placed on private property with the owner's permission. No signs of any kind shall be posted to fences, utility poles, trees, etc. 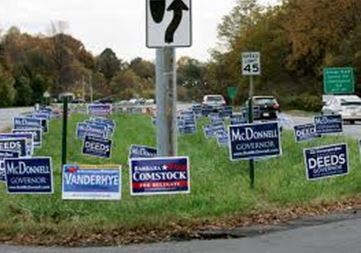 Political signs may not be erected more than 90 days prior to an election and must be removed within three days following the election. By adhering to these regulations, we can all help keep Spanish Fort a great place to live, work and play.